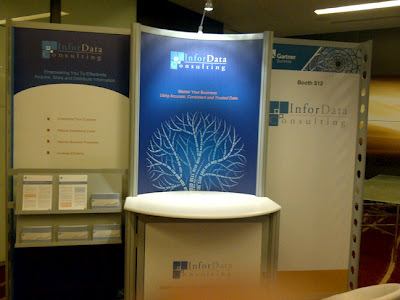 Two weeks ago, I attended Gartner’s Master Data Management Summit in London. What an event it was, both in terms of information and the people. I took a lot away from the event. What struck me was the oft-mentioned challenges organisations face in their bid to attain a single version of the truth – Data Quality and Data Governance. These challenges were not restricted to organisations intent on implementing an MDM solution, but in general something faced by many. What is impressive about Gartner events, and this was not an exception, is their ability to collate existent and, for want of word, should-be practices into a structured workable framework. This was evident in Gartner’s ‘Seven building blocks for MDM’. Gartner’s seven building blocks for MDM touch on Vision, Strategy, Metrics, Information Governance, Organisation and Roles, Information Life Cycle, Enabling Infrastructure. Gartner’s assertion could not have been more accurate. Organisations are aware of these practices, some have already adopted it in one shape or form, but most don’t realise its importance in the successful delivery of an MDM or data integration project. These processes, which practitioners have been preaching for a long time, are a business driven, holistic approach to MDM. During the course of the event, I spoke to many delegates and they all had one common question – How do we deal with data governance and data quality? Decision making and accountability becomes a thorny issue considering Master Data is shared across functions and lines of business. Addressing this challenge plays a big role in putting into place an effective Data Governance program. In a survey by Gartner, 38% of respondents indicated post-implementation that they should have more forcefully managed the analysis and processes pertaining to the initial data quality of the source system master data. This challenge is illustrated in one delegate’s question to me – ”what is the difference between Data Quality and MDM?”. The delegate went further to say they were considering carrying out a data quality initiative, apparently having already implemented an ‘MDM’ solution. The question and statement laid bare the lack of understanding of the importance of Data Quality in an MDM implementation and business processes in general. It was a well-attended summit and my team and I left the arena with one thing in mind – ensure organisations understand the pivotal roles Data Governance and Data Quality play in MDM and Data Integration , and continue to help them achieve their goal.